Nanak Chand Kamboj (8 December 1944 - 5 August 2016) was a well-known Kamboj community worker and strong pillar of Kamboj community who has worked to unite the Kamboj community across the globe by sharing his wisdom. He was true�philanthropist, a�very generous person and�institution in himself. He was a person whose only purpose is to help others, work for the uplift of Kamboj community and people and not caring about what happens to himself. He has devoted whole his life to connect Kamboj people living in different states of India. He motivated all Kamboj people to write Kamboj as surname with theirs names and always be proud to be Kamboj. He has done lot of research on the history of Kamboja and provided lot of historical facts and information about the history of Kamboja to various historians and helped them in reviewing their books and research. During his job, he got a chance to travel to various states of India. He always tries to contact people and gather information about Kamboj community in those states. He has always tries to connect the missing links of history of Kamboja. Now we have Wikipedia and google to get information about Kamboj community and history of Kamboja. He was the Wikipedia in himself. He remembers the history of Kambojas by heart and always shares the history with other people whenever he got chance. He was born on 8th December, 1944 at 69 Chak E B, Mintgumri District, Pakistan in the family of Jamma Ram (father) and Jeewani Bai (mother). He belongs to Kamboj family of Dhanju (????? ) gotra (sub-caste). His father died at very early age when he was only four months old in Pakistan. After the partition of India-Pakistan, he with his mother relocated to village Gidderanwali (?????????? ), Tehsil Abohar, District Fazilka. He was the only child of his parents. Even his father was not having siblings. He relocated to India after partition with his mother, nana and two mamas. Jama Ram was son of Saiya Ram. Jama Ram was married earlier to Sato Bai Dhot. They were not having any kids. So Jama Ram married second time to Jeewani Bai. They gave birth to Nanak Chand. Saiya Ram was son of Kheru Ram. Kheru Ram was son of Haari �(????) Ram. They migrated from Ugru (?????) village to 69 Chak E B, Mintgumri District, Pakistan. Before Ugru they were residing in the village Malluka (???????) in Pakistan. Most of the people in his village was illiterate and not going to schools. His mother pushed him to go to school in another village - Deeweankhera. He worked hard in his childhood as there was no one to guide him for his future. He was listening about Kamboj heroes and other historical stories from his maternal grandfather (nana). He got interest from childhood about our history and started working for the welfare of Kamboj community when he moved out of village for higher school education. 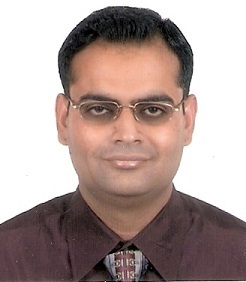 He worked as Hindi and Sanskrit teacher in his initial career. He was having interest in Hindi literature. He wrote lot of articles in Hindi and won lot of awards in the Hindi Literature. He has done a diploma in electrical engineering from college and post-graduate diploma in rice engineering from IIT.�He had joined Food Corporation of India on 11th February, 1969 as Engineering-Incharge. He was retired from Food Corporation of India on 31st December, 2004 as Deputy Manager. Nanak Chand Kamboj got married to Saroj Kamboj, daughter of Ram Kishan Kamboj on 11th May, 1972. Nanak Chand Kamboj is having three sons: Vikram Kamboj, Deepak Kamboj and Navneet Kamboj. Nanak Chand was posted in Chandigarh from 1977 to 1984. During that period there were not enough Kamboj people living in Chandigarh. Every day lot of people from villages and small towns of Punjab and Haryana were coming to Chandigarh for their personal or official work. �They were always staying in his house during night stay or till their work was not completed in Chandigarh. His house was famous as Kamboj Dharmshala. He and His wife Saroj Kamboj never complained and happily welcome all these guests in their house. In September 1984, he was operated for Kidney stone in PGI, Chandigarh. He got 21 stitches for removing stone from his kidney. His blood pressure was always high so he went to operation thetre 7 times and then doctor sent back as his BP was not coming down. 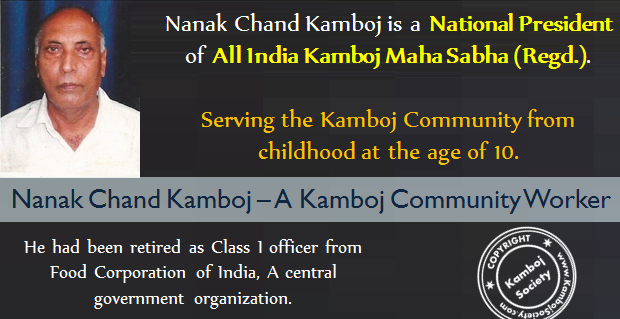 Nanak Chand Kamboj is renowned for his social work done for the Kamboj Community. He is working for the Kamboj community from his childhood at the age of 10. When he was young, he had formed Rising Kamboj Association, Green Chowdhary Association and Navyuvak Kamboj Sabha. The All India Kamboj Maha Sabha was initially formed in the year of 1969 under the convernership of Nanak Chand Kamboj on the occasion of Tomba Mela at Kudsia Ghat, Yamuna river near Tibetian Temple, Delhi and later on, the election of the Maha Sabha was conducted at Kapal Mochan Mela, Bilaspur, Haryana on November 28, 1974 and registered with the Registrar of Firms & Societies Delhi on February 10, 1994 vide Registration no. S/25479 of 1974. As Nanak Chand was a central government employee, he decided not to take the president post of All India Kamboj Mahasabha. Ch. Karta Ram Kamboj of Delhi, was the first President and Nanak Chand Kamboj of Delhi, was the first General Secretary of All India Kamboj Maha Sabha and both were worked continuously on the same posts up to August 2005. Unfortunately, Ch. Karta Ram Kamboj, President of Maha Sabha expired on August 25, 2005. S. Joginder Singh Thind,�Senior Vice President was expired on September 9, 2005. 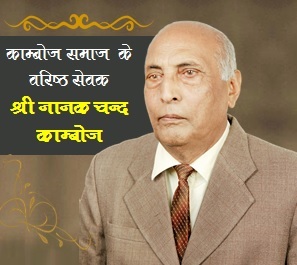 Shri Hardyal Singh Kamal, Vice President of Maha Sabha expired on�August 18, 2006. The death of these office bearers of All India Kamboj Maha Sabha created a big vacuum in the Maha Sabha. After the death of Ch. Karta Ram Kamboj, Nanak Chand Kamboj was nominated by the National Executive Committee as Acting President of All India Kamboj Maha Sabha and subsequently was authorised to arrange the election of the National Executive Committee. The election of�All India Kamboj Maha Sabha was conducted on July 22, 2007 at Amar Ashram Patiala. In the election, Nanak Chand Kamboj was unanimously re-elected as National President of All India Kamboj Maha Sabha. He was National President of�All India Kamboj Maha Sabha till his last breathe. With the sincere efforts of Nanak Chand Kamboj, a separate body “Shaheed Udham Singh Kamboj Samarak Trust (Regd) Delhi” was formed in the year 1970 at the occasion of Tomba Mela for the construction of Shaheed Udham Singh Samarak Dharamshala in 984 sq mtrs plot allotted by Delhi Administration at Shalimar Bagh Delhi. The foundation stone of the same was laid on 26th Dec 1981 by Shri N. R. Lashkar Hon’ble Health Minister Govt. of India in the presence of Ch. Des Raj Education Minister Haryana and the construction was completed within 4-5 years. Free kitchen/ free langar & other living facilities have since been provided for the travelers / visitors. Nanak Chand was posted in Jaipur from 1984 to 1992. Sawai Man Singh Hospital is the major hospital of Jaipur and Rajasthan and for other neighbouring states like Haryana. This hospital was famous for Kidney stone and some serious illnesses. Lot of people from villages and small towns of Rajasthan�and Haryana were coming to Jaipur for their treatment at Sawai Man Singh Hospital. �They were poor and have not enough money to stay in Dharmshala. Also they were not knowing anybody in Jaipur. All those patients and their relatives were always coming to him and staying in his house in Jaipur. He and along with his wife Saroj Kamboj visiting all these patients in Sawai Man Singh Hospital in the morning and evening daily. They were taking food and other items for them. He was also helping them to get proper accommodation in the Dharamshala. Now most of the doctors, nurses and ward boys were familiar of Nanak Chand and his wife. He was famous as Dr. Kamboj. With the vigorous efforts of All India Kamboj Maha Sabha, the remains and ashes of Shaheed Udham Singh from London to his native place Sunam were brought through Govt. of Punjab and Govt. of India to Delhi on 19th July 1974 and thereafter these ashes were taken to Sunam on 31st July 1974 as per his last wishes for cremation as per his last wishes and befitting receptions in a glorious way in very huge processions at various places in Delhi, Haryana, Punjab & Uttar Pradesh were accorded. The rites of cremation were performed at Sunam on 31st July, 1974 and later on, the ashes were emerged in the waters of river Sutlej at Kiratpur Sahib in Punjab on 2nd August 1974 and were emerged on 3rd August 1974 in the waters of River Ganga at Har-Ki-Pauri Haridwar in UP and were buried at Roza Sharif Sirhind in Punjab on 21st August 1974. The reception of remains/ ashes were arranged at Kapurthala House, New Delhi by All India Kamboj Maha Sabha after joint meeting with cabinet of Punjab Govt. & two cars & one bus of office bearers of All India Kamboj Maha Sabha (Regd) Delhi remained along with the processions from Delhi to Sunam and thereafter form Sunam to Haridwar during the processions, thousands hand book & pamphlets on the life of National Hero Udham Singh were also distributed. He became the Convener of Indo-Cambodia Friendship and Cultural Association under the chairmanship of Swami V. Dharamveera, Ashoka Mission, Mehrauli, New Delhi. All India Kamboj Mahasabha and The Royal Cambodian Family: The All India Kamboj Mahasabha meeting held in 1952 was especially attended by Swami Dharam-Wong, the Acharya and Royal Guru of young Cambodian Prince, Norodham Sihanouk. Again, Rajguru Swami Dharama Wong especially visited Punjab to attend the Memorial Fair in honor of Shaheed Udham Singh at Sunam on March 27, 1955. The Prince Norodom Sihanouk extended a special invitation to a Delegation of Indian Kambojas on behalf of Cambodian government in 1959. Nanak Chand Kamboj has again decided not to be part of delegation for visiting Cambodia as he was central government employee. 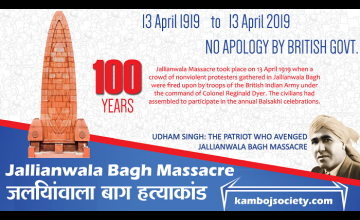 The Kamboj delegate consisted of several prominent Kamboj personages of the day, including Col Lal Singh Thind, a famous landlord of Uttarpardesh, Mr. Himat Singh Thind, Advocate (Saharanpur), S. Hazara Singh Jossan, President, All India Kamboj Mahasabha (Delhi) and Dr Ganga Singh Soni (Khemkaran, Panjab), President, Indo-Cambodian Friendship and Cultural Association etc. The Delegation of Indian Kambojs was headed by Dr Ganga Singh Soni. This Kamboja Delegation was given a rousing and royal treatment in Cambodia by Cambodian Imperial family as well as by the Kambuja (Cambodian) people. (Vishal Kamboj, Uttar Pardesh, p 11; These Kamboj People, 1980, p 160, K. S. Dardi; for further ref: Kamboj History, 1972, by H. S. Thind). Nanak Chand Kamboj was having a diabetics and high blood pressure for long time. Suddenly he got some low blood sugar attacks and then his health started deteriorating. He died on 5th August 2016 after a long illness in Chandigarh. His death has created a very big vacuum in the Kamboj community in the country. He will be always remembered for his kind heart, generous nature, simpleness, down-to-earth personality, �work done for welfare of Kamboj community and social work for long time.